Specialized Solar Systems popular mid-level 3kVA 9-12kWh off-grid solar system. Generating a daily average of 12kWhrs with a battery storage that supports 9kWhrs of daily electrical energy usage. Thank you for your inquiry and interest in Specialized Solar Systems. Unfortunately, due to the load-shedding and increased demand for renewables, we regrettably are unable to service the Gauteng region and Cape Town area. We are currently being inundated with queries and are doing our very best to respond to all in a timely manner. We do apologise for this inconvenience and ask that you please be patient as we attempt to deal with the flood of inquiries. Please enter a Comment. Include planned installation location if you require a solar energy system. Our popular mid-level off-grid residential solar system designed by Specialized Solar Systems. Using superior quality solar components, this off-grid solar system will supply our customers with a daily average of 12kWhs of solar-generated energy electricity. It includes a battery storage capacity that supports 9kW hours of daily electrical energy usage directly from the battery before reaching a 27% Depth of discharge (DOD), therefore maximizing the batteries lifespan. Off-grid power systems supply electricity to properties that are not connected to the public electricity network. These renerwable energy systems are essentially independent power stations capable of powering a wide range of applications with dependable and reliable electricity that is no different to that supplied by the national electricity grid. Whether it be a small or large new or existing home, a station, business or an entire community that depends on large diesel generators, off-grid stand-alone power systems are commonly the reliable, clean, hassle free, cost competitive answer! It is Specialized Solar Systems recommendation that our customers use energy saving principles are put into practice and taken into consideration before such a system is purchased i.e. low wattage lighting, gas stove/geyser etc. For an overview on Specialized Solar Systems residential off-grid solar systems please view this link. To have an average input of 12kWh/day from your solar modules in George, South Africa you will need a solar module array of 2250Watt. These solar modules have a 10 year manufacturer’s product guarantee and a terrestrial 25 year 80% yield. NB. Solar yield is determined by location, orientation, shading and panel surface condition, system usage and weather condition at a 34° Tilt Angle Facing North with full day exposure to the sun i.e. no shading. 1380Amp 10-15year Lifespan, 2V Millennium Deep Cycle Batteries with interconnecting cables. These batteries will have the capacity in storage at 9kWh’s usage per day to cycle your system 27% maintaining system efficiency and battery lifespan, please note that actual cycle ratios may vary from installation to installation depending on system use. Please note during daylight hour’s system runs off PV as Primary, Battery as secondary. The essential function of a battery monitor is to calculate ampere-hours consumed and the state of charge of a battery. Ampere-hours consumed is calculated by integrating the current flowing in or out of the battery. In case of a constant current, this integration is equivalent to current multiplied by time. A discharge current of 10A during 2 hours, for example, amounts to 20Ah consumed. All our battery monitors are based on a powerful microprocessor, programmed with the algorithms needed for precision monitoring. Time to go at the current rate of discharge. Visual and audible alarm: over- and under voltage, and/or battery discharged. Programmable alarm or generator start relay. 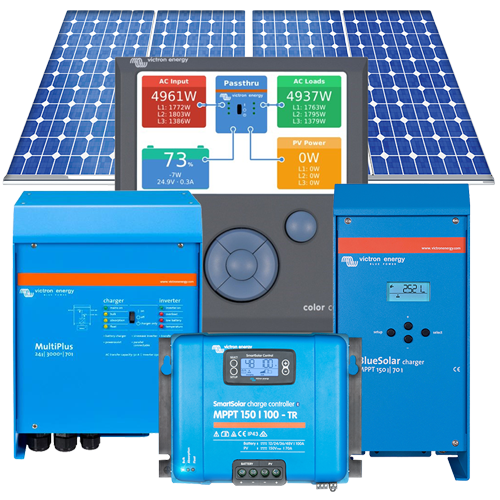 The Blue Solar MPPT 150/70 and 150/85 charge controllers will charge a lower nominal-voltage battery from a higher nominal voltage PV array. The controller will automatically adjust to a 12, 24, 36, or 48 V nominal battery voltage. If partial shading occurs, two or more maximum power points may be present on the power-voltage curve. Conventional MPPT’s tend to lock to a local MPP, which may not be the optimum MPP. The innovative Blue Solar algorithm will always maximize energy harvest by locking to the optimum MPP. Maximum efficiency exceeds 98%. Full output current up to 40°C (104°F). One user programmable algorithm. Manual or automatic equalization. Battery temperature sensor. Over-temperature protection and power derating when temperatures is high. PV short circuit and PV reverse polarity protection. PV short circuit and PV reverse polarity protection. Reverse current protection. 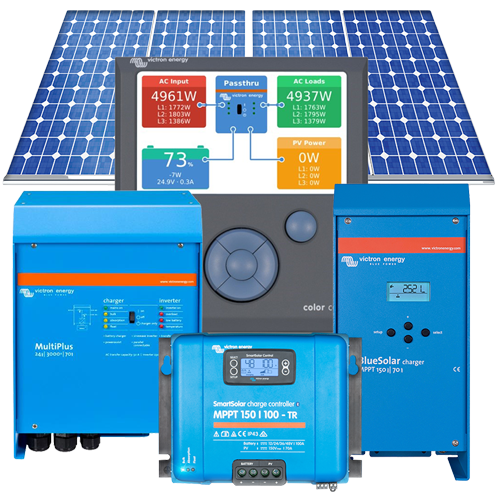 The Multiplus is a powerful true sine wave inverter, a sophisticated battery charger that features adaptive charge technology, and a high-speed AC transfer switch in a single compact enclosure. Next to these primary functions, the Multiplus has several advanced features, as outlined below. The main output has no-break functionality. The Multiplus takes over the supply to the connected loads in the event of a grid failure or when shore/generator power is disconnected. This happens so fast (less than 20 milliseconds) that computers and other electronic equipment will continue to operate without disruption. The second output is live only when AC is available on one of the inputs of the Multiplus. Loads that should not discharge the battery, like a water heater, for example, can be connected to this output (second output available on models with 50A transfer switch only). Up to 6 Multi’s can operate in parallel to achieve higher power output. Six 24/5000/120 units, for example, will provide 25 kW / 30 kVA output power with 720 Amps charging capacity. In addition to parallel connection, three units of the same model can be configured for three-phase output. But that’s not all: up to 6 sets of three units can be parallel connected for a huge 75 kW / 90 kVA inverter and more than 2000 Amps charging capacity. The Multi Plus is a very powerful battery charger. It will, therefore, draw a lot of current from the generator or shore side supply (nearly 10A per 5kVA Multi at 230VAC). With the Multi Control Panel a maximum generator or shore current can be set. The Multi Plus will then take account of other AC loads and use whatever is extra for charging, thus preventing the generator or shore supply from being overloaded. Multi Plus will make sure that insufficient shore or generator power is immediately compensated for by power from the battery. When the load reduces, the spare power is used to recharge the battery. Multi Plus will charge a second battery using an independent trickle charge output intended for a main engine or generator starter battery (trickle charge output available on 12V and 24V models only). The Color Control provides intuitive control and monitoring for all products connected to it. The list of Victron products that can be connected is endless: Inverters, Multi’s, Quattro’s, all our latest MPPTs, BMV-600, BMV-700, Lynx Ion and even more. Besides monitoring and controlling products on the Color Control GX, the information is also forwarded to our free remote monitoring website: the VRM Online Portal. To get an impression of the VRM Online Portal, visit https://vrm.victronenergy.com/, and try our demo. See also the kWh dashboard screenshot further down in this datasheet. The Color Control has endless possibilities. To implement all our ideas and wishes will take years. There are therefore many features that are not yet available. Functions marked with ‘Future function’ will become available later on, as a firmware update. Firmware updates are free of charge, as with all Victron products. Updating the product is easy: the Color Control GX will update itself automatically, as long as it is connected to the internet. Manual updates can be done with a USB stick and micro SD cards. All Pictures shown are for illustration purpose only. Actual product may vary due to product type and enhancements. Generally, off-grid solar system sizing or specifications are based on your daily wattage usage and peak Wh requirement. Daily watt-hour usage can normally be calculated from your utility bill over a time-period but may require more accurate usage pattern monitoring with energy metering data loggers. Customers should please contact us for a quote following your off-grid solar system selection or if you require expert help with choosing the correct off-grid solar system to satisfy your immediate and future home or business solar energy requirements. When making an inquiry, please include the location where you plan to install your off-grid solar energy system. All prices quoted excluding VAT. A 50% deposit is payable on acceptance of quote. Delivery of products should take place 4 to 6 weeks from 50% deposit payment. All equipment remains the property of Specialized Solar Systems until fully paid. Equipment installed and installations carry a one year guarantee. Plan your move to energy liberation today. Start enjoying the many benefits that solar generated electricity offers with added cost savings and energy security. Unfortunately, due to the load-shedding and increased demand for renewables, we regrettably are unable to service the Gauteng region and Cape Town area. We are currently being inundated with queries and are doing our very best to respond to all in a timely manner.We do apologise for this inconvenience and ask that you please be patient as we attempt to deal with the flood of inquiries. Thank you for your inquiry and interest in Specialized Solar Systems.Unfortunately, due to the load-shedding and increased demand for renewables, we regrettably are unable to service the Gauteng region and Cape Town area. We are currently being inundated with queries and are doing our very best to respond to all in a timely manner.We do apologise for this inconvenience and ask that you please be patient as we attempt to deal with the flood of inquiries.